"Bestack and Unibo patent "active" packaging"
Annual estimated savings of over €190 million and 115 thousand tons of strawberries, apricots and nectarines that will not go to waste. In addition: fruit and vegetables look better, are fresher and healthier and last longer. This is all thanks to the corrugated cardboard of "active" Bestack packaging, an innovative product that the company presented at Macfrut. 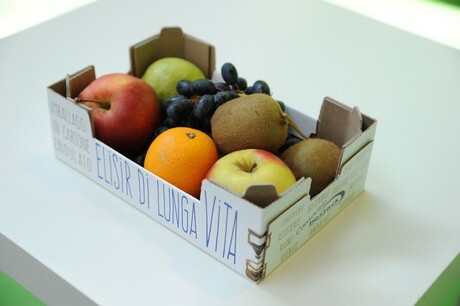 Fruit and vegetable crates are made of corrugated cardboard enhanced with a concentrated solution of natural essential oils that counter perishability. The product was developed in cooperation with the Comieco consortium. The calculation, based on the research conducted by the University of Bologna on the use of innovative packaging for produce, is just a first result. This new cardboard can reduce waste leading to savings of €1 billion for 850 thousand tons of produce, i.e. 10% of the fruit and vegetables consumed in Italy for a year. This Bestack patent is part of the new anti-waste regulation, law 166, published on the Gazzetta Ufficiale on 30th August. "The law deals with a topic that public opinion is increasingly interested in. Waste is unavoidably connected to food conservation and is even more relevant for fresh and ultra-fresh products. If, therefore, the fresh produce sector is to be strategic for Italian agriculture, research and development projects in this field are a priority. Bestack has developed a tool that protects and improves the products," explains Bestack Director Claudio Dall'Agata (in the photo below). We patented the product in November 2015 and we are now ready to launch it. Research was carried out by professor Rosalba Lanciotti's team at the University of Bologna. The objective was to find a packaging that could counter the perishability of fruit and vegetables, prolong commercialisation and increase shelf-life. 4,500 analyses and 200 samplings on strawberries, apricots and nectarines were carried out over three months. Research showed that the use of active packaging helped counter the proliferation of deteriorating organisms, especially in warmer temperatures. Waste went down from 13 to 8% for strawberries, 18 to 13% for apricots and 25 to 20% for nectarines. In addition, shelf-life is one to one and a half days longer. This in turn means better economic and environmental sustainability. In Italy, by using Bestack active packaging, it would be possible to avoid wasting 8,300 tons of strawberries at a value of €29.1 million, 12,000 tons of apricots with a value of 27.9 million and 84,000 tons of peaches and nectarines, for a total value of €134 million.